Whilst there is some argument over which church Shakespeare got married in, there’s absolutely no doubt about where he is buried. You’ll find his tomb marked by a gravestone within Holy Trinity Church in the centre of Stratford alongside other members of his family. 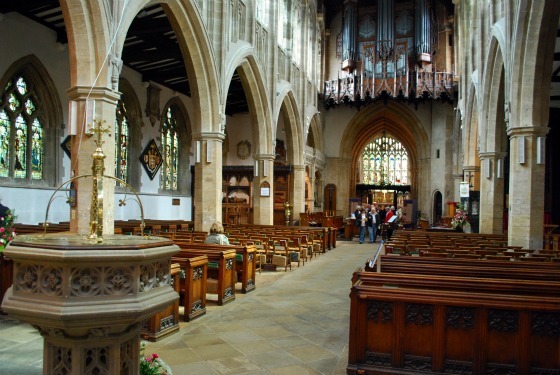 The church is a traditional English design and it’s free to enter and have a look around. The altar section where Shakespeare’s grave is located though does have an suggested donation charge. Apart from the grave, there’s an extra memorial to Shakespeare in the bust which is a feature on the wall. Away from the grave, spend a bit of time looking at the stained glass windows and the impressive organ pipes in the church which we thought were particularly striking. This is an extract from our free Shakespeare Country Guide. 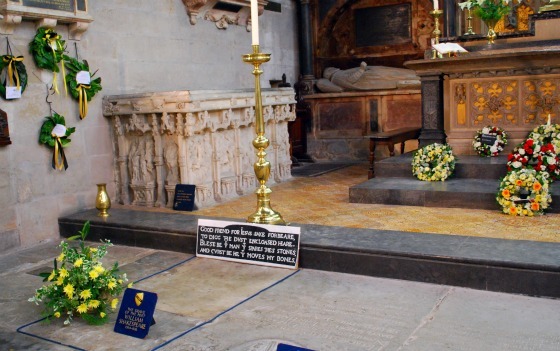 Shakespeare’s Grave is located in the Chancel of the church in front of the Altar. His grave is outlined with a blue rope (see above) and his wife Anne is next to him. 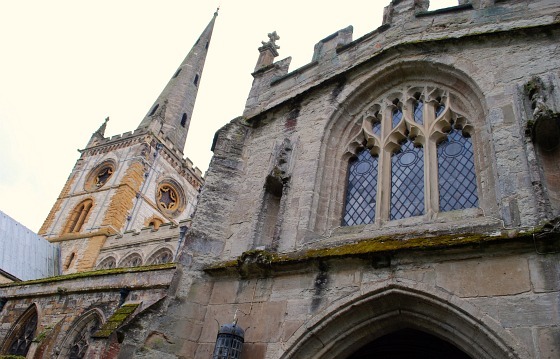 Shakespeare secured this prime burial location by offering large donations to the church and by becoming a ‘lay rector’. You will also find on display copies of the register entries for his burial and also his baptism. The original font where he was baptised is also located here. This church has been used for worship since 1210 and if you want to experience a service, then we are assured you’ll be very welcome. 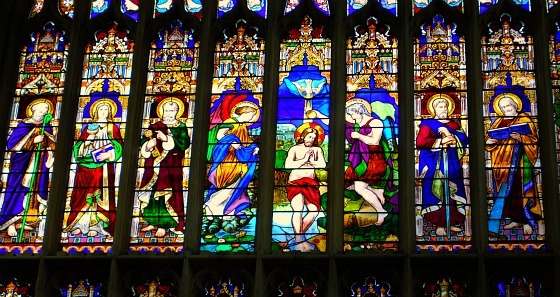 On Sunday’s there are services at 10.30am and 6pm and Morning Prayer takes place Tuesday to Friday at 9.15am. When leaving the church, head down Old Town road towards Hall’s Croft and you will find a lovely memorial garden on your left hand side which is free to enter.